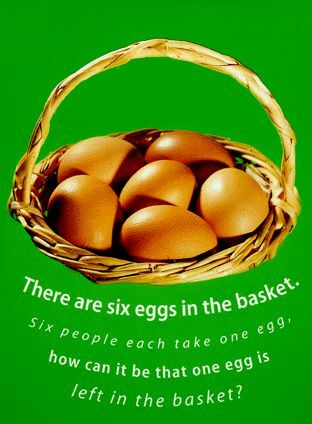 Here I present yet another post for the series Lateral Thinking with totally new and bind-boggling questions. Once again 5-6 questions have been presented and you have to try and an answer them. Though I bet you can’t, but then last time I checked, trying was free. The answers have been provided below but have been encrypted using the same encryption as last time. Clicking the encrypted answers will take you to the answer in its decrypted form. Yet again I repeat. Please refrain from using Google. It may give you the answer but not the satisfaction. Dolty was warned by his mother never to open the cellar door or he would see things that he was not meant to see. One day while his mother was out he did open the cellar door. What did he see? The waiter replied, “I will bring you a fresh cup.” After a few moments, the man called out, “This is the same cup of tea!” How did he know? The telephone rang in the middle of the night and the woman woke up. When she answered it the caller hung up. The caller felt better. A man and his son are in a car crash. The father is killed and the child is taken to hospital gravely injured. When he gets there, the surgeon says, ‘I can’t operate on this boy – for he is my son!! !’ How can this possibly be? When Dolty opened the cellar door he saw the living room and, through its windows, the garden. He had never seen these before because his mother had kept him all his life in the cellar. The man had already put sugar into the tea. Pick up 2nd glass, pour its contents into 5th glass, return 2nd glass to its place. The fireman is the only man in the room. The rest of the poker players are women. The woman was snoring and so the caller phoned her to stop it. The surgeon can not operate on her own son; she is his mother. I like your blog, probably because I am techie idiot.. 🙁 So, have a lot of things to learn here! Great! As far as Lateral thinking is concerned, I am going to get to Google to find out what the heck that means.. :)) The questions sound like fun, but I am going to reserve them for my evening to ponder upon.. Cant seem to figure out even one answer.. ! Also, FYI, your Lateral thinking (part 1) takes me to a "Page not found" error.